Thanks for the download! I am doing a Readbox bulletin board for my elementary school library. Since March is Reading Month, we are going with a popcorn theme and books into movies theme. 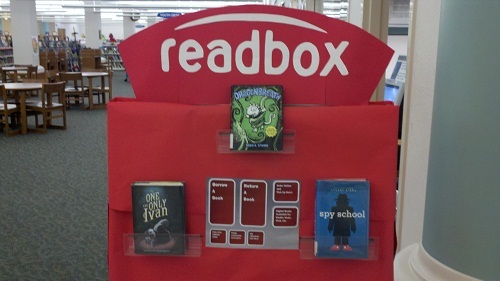 I’m going to do a readbox display sometime this week! I’m so happy you posted the “Rent a Book” sign. Thanks so much!! Discussion has commenced on putting up a readbox display in the high school library of the alternative program of Rowan County- Henderson Independent to be specific.